You'll need to email Maria to rsvp and then mail a check to the restaurant. (Email and street address are on their invite here: La Riviera Invitation.) The dinner is Monday, October 27th with an overflow night of Monday, November 17th. 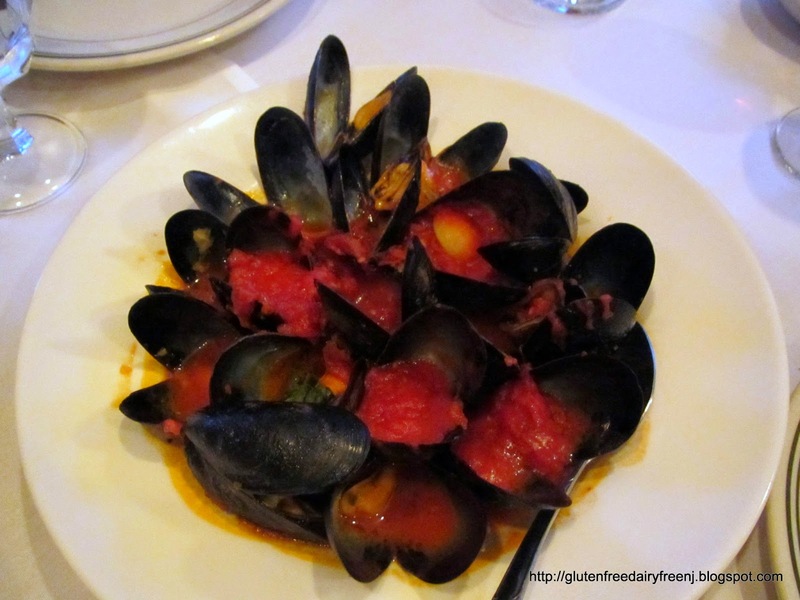 I've been a number of times since they started offering these, in fact, I reviewed one of the dinners back in 2011 - the menu varies a bit but the food (and especially the sauce) remains as amazing as ever: Review of the Gluten Free Dinner at La Riviera. I've been working on a tomato free ketchup for about a year now. 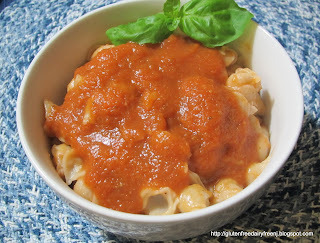 I tried to base this on my tomato free sauce but it was a lot more work and wasn't quite as good as this one. I loosely based this on a couple of other recipes I found that contained pears, carrots and cranberry sauce. Pears have a gritty texture that remained in the final ketchup. Originally, I was using corn syrup as I thought the sugar wouldn't dissolve fully. It is much better with the sugar and if you mix it with the vinegar it dissolves. Finally, if you don't want to use beet juice you can use 8-10 drops of red food coloring (but you can't taste the beets). Dissolve the sugar in the vinegar. Drain the yams, reserving the liquid for later. Place all ingredients except the beets/food coloring in a blender and blend until smooth. If needed add the reserved liquid from the yams in small amounts until you have the correct consistency. Penne alla vodka (or penne a la vodka if you prefer) is the trifecta of food intolerances for me: it's main ingredients are gluten, dairy, and tomato. I had tried making it years ago (when I was just gluten and dairy free) but I used soy milk. Soy milk has a very distinct flavor that is difficult to hide in any dish and my dairy free penne alla vodka was no exception. I recently saw a coconut milk creamer in my local supermarket and decided to try again. Now plain coconut milk creamer (sold in a 16oz carton with the other coffee creamers) has a very slight coconut flavor to it, but that flavor (unlike the soy) was completely undetectable in the final dish. *** omit if using tomato free sauce that has already been seasoned. Measure 1/4 cup of vodka away from the stove. [WARNING: do not pour directly from vodka bottle into the pan as the bottle could catch fire and explode.] Add to the pan bring to a low boil. Boil for about 5 minutes. Add the cup of coconut milk creamer, bring to a boil then lower to a simmer for about 20 minutes (sauce should reduce by about half). While the sauce is simmering prepare the penne according to directions. Cook until heated through (about 5 minutes) being careful to not overcook (the beets in the sauce will brown if you do). Toss the cooked and drained pasta in the sauce and serve! Garnish with Vegan Parmesan topping if desired. Or check my full list of recipes and the allergens they are free of. My first Meatball Parm Sub in years! I recently had lunch (and took home dinner) from River Edge Pizza Kitchen (830 Kinderkamack Road, River Edge, NJ 07661) and enjoyed it greatly. I first heard about the restaurant from the Northern NJ Celiac Meetup. I was particularly drawn to the fact that they also offer dairy free / vegan cheese. In addition, they have gluten free pasta, gluten free pizza crust (imported from italy), gluten free fries, gluten free fried calamari (both in a dedicated frier), gluten free heros, gluten free bread crumbs, gluten free wraps, gf garlic bread, and gluten free meatballs. The restaurant is a store front with a couple of small tables upfront to eat in. The food is some of the best Italian food I've had but a bit expensive. The pizza crust was soft and came in its own foil lined pan. The hero rolls are Schar and the vegan cheese is daiya. There is a $3 surcharge for gluten free items (and a $5 surcharge on the gluten free dinners) [not sure if there was an up-charge for the vegan cheese]. The grandchildren of the owners (husband and wife) are gluten free and dairy free and even the husband himself is now finding he has issues with gluten. If I lived or worked closer this is somewhere I would go back to – especially for gluten free / dairy free meatball parm, gf/df chicken parm or a gf/df pizza! Last Friday I had lunch at the recently opened eat healthy deli (24 Little Fals Road, Fairfield, NJ 07004) [Their website may not be up yet, so here's their facebook page]. They offer three brands of gluten free breads (No Way! It's Gluten Free, Get Fresh Bakehouse, and Schär) [not all are dairy free] and Applegate Farms cold cuts. All of their soups are gluten free (one was vegan the day I was there). They have a U shaped 'bar' with seating but no tables if you want to eat in. When was the last time you saw a sign this welcoming?!?! They also have a 100% gluten free bakery onsite and full lists of ingredients for each of the baked good. Only some of the baked goods the day I was there were also dairy free but the baker will accommodate any request she can with advanced notice. eat healthy is open for breakfast and lunch six days a week (closed Sundays). A lot of the breakfast items can be made dairy free and they even have vegan butter! They are looking to expand eventually to offer dinner and offer grab and go dinners as well. In addition to gluten free the owners are big on non-GMO, offer organic where they can, and even have compostable flatware and plates. There are a number of gluten free products for sale (Ancient Harvest, Bob's Red Mill, Canyon Bakehouse, Contes, Feel Good Foods, Get Fresh Bakehouse, Gratify, Jovial, Kind, Namaste, No Way It's Gluten Free, and Schär) as well as a number of grocery items. So, how was the food? Amazing! I had 'The Butcher' a grilled ribeye steak on a No Way! It's Gluten Free sub roll. They pressed the sandwich in their panini press and the roll held together through the whole lunch. And that is the nice thing about a 100% Gf restaurant, the panini press is dedicated gf, the toaster is dedicated gf, the prep area is dedicated gf, etc, etc! This is definitely somewhere I'm hoping to go back to quite often. 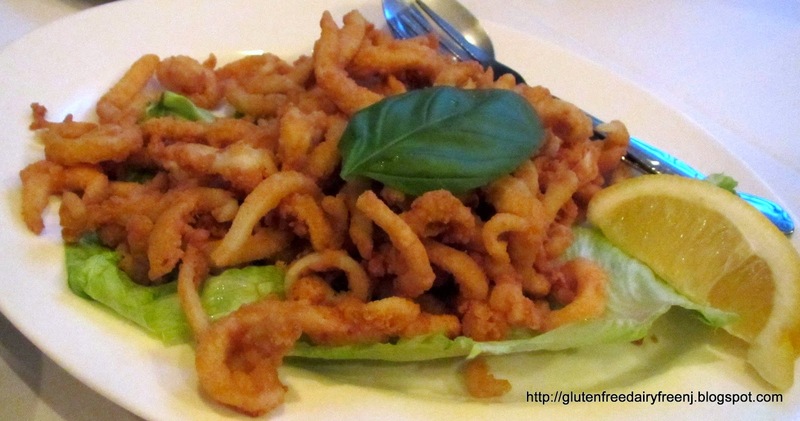 And of course, check out the full list of restaurants with gluten free menus. I had a great all around experience at Cinders Wood Fire Grill (319 Route 46W, Mine Hill, NJ 07803) last night. For starters, Cinders flags the gluten free items on their menu with a small green diamond. There were nine tapas (appetizers), eight entrees, and six sides. There is also a note that any item without the sauce or without bread would be gluten free. Their specials list wasn't flagged but I figured I'd ask about an interesting sounding swordfish with peaches and sweet barbeque glaze since I needed to inquire about dairy free anyway. The waiter was very helpful and offered to check with the kitchen without being asked (always a good sign). They couldn't make the dish both gluten and dairy free as written but the chef offered to prepare the swordfish with a gf/df garlic wine sauce instead! In the end, I decided to try the Woodgrilled Half Chicken (naturally both gf/df), with a side of grill asparagus and gluten free shoestring fries! Overall a great time and somewhere with enough gluten free variety on the menu that I'm sure to go back! Or search my full gluten free restaurant list! One of my favorite meals at a chinese restaurant is Sesame Chicken so I had to try their and I wasn't disappointed. It was just as good as I remember from before I gave up gluten. The food was so good I ended up ordering another two dinners to take home and eat over the following nights. Even as left overs, the gluten free chicken and broccoli and the gluten free beef with asparagus were terrific. China Sea has a large eat in dining room and also does a brisk take out business. It is located in the Marketplace of Absecon strip mall (right past the Arby's). There's even a note on their website that for orders of $50 or more, they will deliver to AC casinos! It's a bit far of a drive for me, but this is definitely somewhere I would return if I were in the area.